This is the second round of this swap for those who may have missed the one earlier this month. Snail mail one partner a note saying why you’re interested or intrigued by the idea of writing a book in a month. 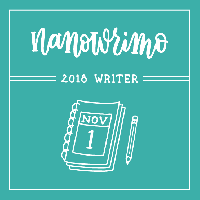 I have done NaNo for six years, and love it. I joined because I hope I can encourage someone else to at least give it a try. An envelope is dropped in the box for a.m. pickup out to my partner. Enjoy! Just wanted to let my partner know I dropped my letter off yesterday directly at the post office. It should be postmarked for the 5th, but I dropped it off after 4... I forgot they closed early >.< Oops. Good luck with NaNoWriMo everyone!